Kenneth A. James, a retired service station operator and World War II veteran who saw the aftermath of the atomic bomb in Nagasaki, died Tuesday in Erie County Medical Center after a short illness. He was 95. Born in Big Run, Pa., near Punxsutawney, he left high school after two years to support his widowed mother, first by working in a chicken hatchery, then as a truck driver. In 1940, he came to Buffalo to join his late brother, Elmer, who was working for Curtiss-Wright, building airplanes. Mr. James worked there, too, until he joined the Navy in 1943. As a seaman first class manning the 8-inch guns aboard the USS Wichita, he took part in nine major battles, including the Battles of the Philippine Sea and Leyte Gulf and the invasion of Okinawa. Returning to Buffalo, he worked for a private detective agency and, during his appearances in court, he met Ruth A. Seitz, a buyer for the former Flint and Kent department store. They were married in 1952. That year Mr. James leased the Country Club Service Station at Main Street and Youngs Road in Amherst, found success and went on to build an apartment house on adjacent property. He then built his own shop, another Country Club Service Station, at Sheridan Drive and Shimerville Road in Clarence, which he operated until he retired in 1995. He was active in Holy Trinity Lutheran Church, serving as an usher, and was a member of Clarence Post 838, American Legion. In retirement, he enjoyed gardening and reading. A longtime Clarence resident, he lived for the past few years at Greenfield Manor in Lancaster, where he displayed a large American flag outside his apartment. He did not talk much about his Navy service, his wife said, until the 70th anniversary of the Japanese attack on Pearl Harbor in 2011, when he was interviewed by Buffalo News reporter Lou Michel. He then told how, eight days after the bombing of Nagasaki in 1945, he was among the troops who went ashore to liberate a prison camp. He fulfilled a longtime wish to return to Pearl Harbor, the Wichita’s home port, in 2012. In addition to his wife, survivors include nieces and nephews. 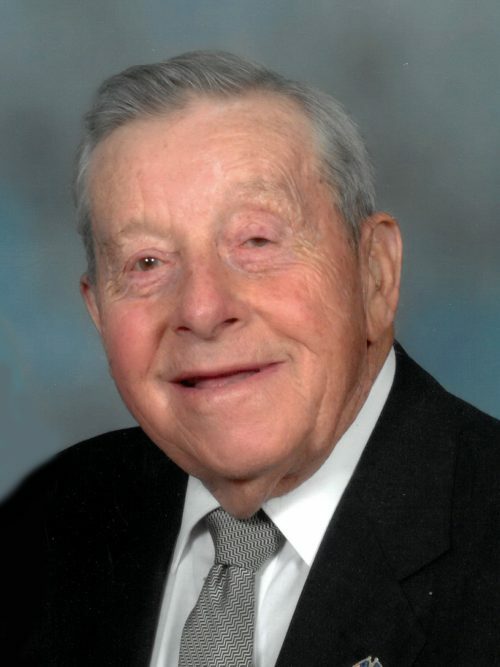 A funeral service will be held at 11:30 a.m. Saturday, April 13, in Amigone Funeral Home, 8440 Main St., Clarence.